Sophisticated, handcrafted candles that glow—really glow—from the inside out. Made Up North. Packaged locally by mentally challenged adults. 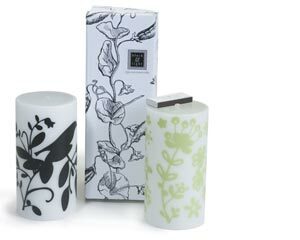 Plus, the stylish designs of Black & Light Co. candles boast an impressive 15-hour-per-inch burn time (about three times the average store-bought candle) and are presented in beautiful, reusable cases embossed with an illuminating quote and outfitted with a drawer where a matching matchbox hides. We’re sold. At Home, Lake Leelanau, 231-256-7855; Cali’s, Traverse City, 231-947-0633; Haystacks in Suttons Bay, 231-271-0280 and Leland, 231-256-9730; direct from Black & Light Co., 866-684-7973.